Temperature : Max 38° C & Min 13° C in Summer. Max 37° C & Min 11° C in Winter. 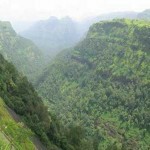 Khandala in Pune district is one of the hill station and popular mountain resorts in Mahashtra. 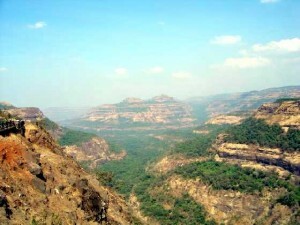 Nestling in the Western Ghats, Khandala has serene and scenic surrounding and healthy climate. Air: Nearest airport is Pune is 71 km and the convenient airport is Mumbar 78 km away. Rail: Khandala is also halt station on Mumbai – Pune rail rout. Road: Khandala is on the National Highway between Mumbai and Pune. Maharashtra State Transport buses plying between Mumbai and Pune halt at Khandala. 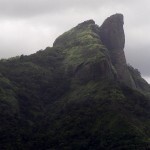 Duke’s Nose: Duke’s Nose is situated 8 km away and universally known as a landmark of Khandala. Rajmahal Point: 2 km away Rajmahal Point is ideally situated right along the National Highway and has a park. Rajmahal Fort: This fort is situated 16 km awat fro Khandala. It is a twin fort. The one on East is Srivardhan and on West is Manranjan, 725 and 800 meters above sea level respectively. Tiger Leap: This place is situated 18 km away. It is a pleasant valley about 650 meters deep. This entry was posted in Khandala, Maharashtra and tagged khandala india, khandala tour, khandala travel. Bookmark the permalink.